People have been asking, sometimes jokingly, for a recipe for groundhog. Although we were skeptical about the potential for creating a delicious meal out of a groundhog, surprisingly, we succeeded! Young groundhogs/woodchucks are preferred for taste and tenderness. Prior to cooking, you need to remove the glands found under the armpits and on the lower back of the groundhog. 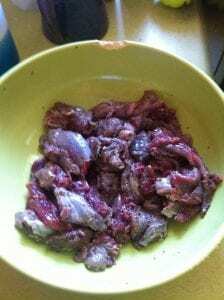 It is extremely important for taste reasons that these glands, along with as much fat as possible, be removed during the cleaning and deboning process before cooking. While the lower back glands will most likely be removed during the skinning process, it is easy to identify and remove the arm pit glands by their burnt yellow/orange color. If this is done successfully, after following this recipe, you will have an end result in meat extremely similar to that of beef stew meat, only without the excess fatty parts. It was surprisingly extremely delicious!! Combine the apple cider vinegar, water, sugar, and salt together in a plastic or glass bowl to create the brine. Immerse the groundhog in the liquid and soak overnight or for up to 24 hours, turning half way through to make sure the meat is evenly saturated. After the meat has finished brining, remove it from the brine and rinse it off. 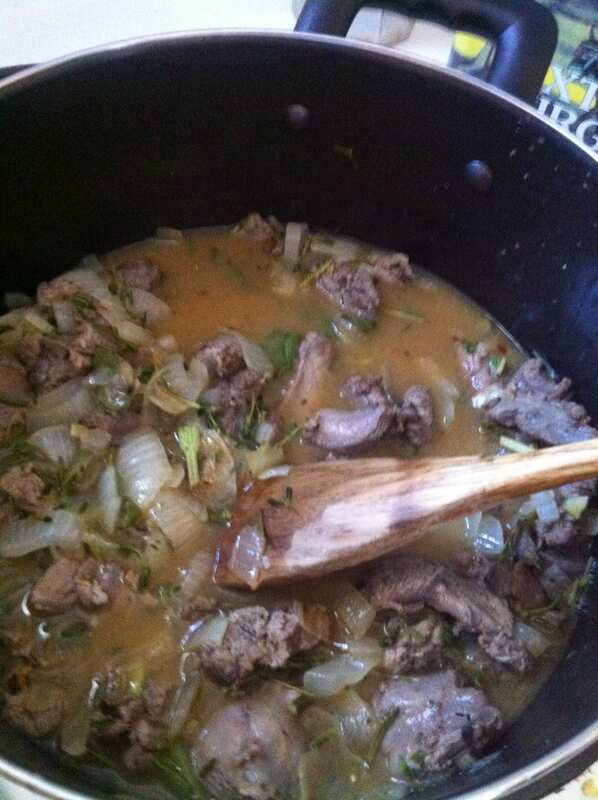 Pat the meat dry, then place it in a bowl and season with 1 tablespoon salt and 1 tablespoon pepper. Toss the meat in order to season evenly. Heat the olive oil in a frying pan or heavy skillet and place the meat in the pan just to brown the sides. 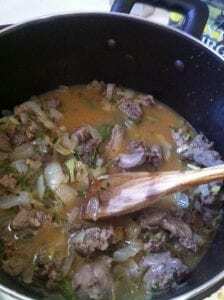 Once the meat has been browned (but not cooked through), transfer the meat to a heavy pot. Keep the skillet to the side. Add the chicken broth to the pot. Take the skillet and pour off any excess fat still in the pan. Add the onion, garlic, herbs, and 3 tablespoons butter and cook over medium heat. Be sure to stir and scrape up any brown bits left in the pan from the groundhog. Cook until onions are softened, about 5 minutes. Add the onion and herb mixture to the pot with the groundhog and add the wine and boil until the entire liquid is reduced by half, about 8 or 10 minutes. Once the liquid has reduced, cover the pot and bring to a gentle simmer over medium heat. Braise the groundhog until it is very tender, about an hour and a half to 2 hours. After the groundhog is tender, transfer the meat to a serving dish to keep warm. Bring the liquid remaining in the pot to a boil and reduce it to about 3 cups. This will take about another 10 minutes. Whisk in the dijon mustard. Remove the pan from heat and add in the remaining 3 tablespoons butter, swirling until incorporated. You can serve this mixture over the groundhog, or you can strain it by placing it in a colander and squeezing the sides to get just the pure sauce out while keeping the onions and herbs removed, if desired. Serve over rice with a side of vegetables or a side salad and enjoy!